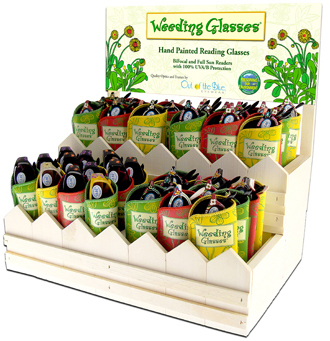 The very popular Weeding Glasses package arrives with 48 beautiful hand painted readers in strengths from +1.25 through +3.00 in a newly designed wooden display. Up to 12 floral patterns in each display. All 48 readers come in padded vinyl cases. 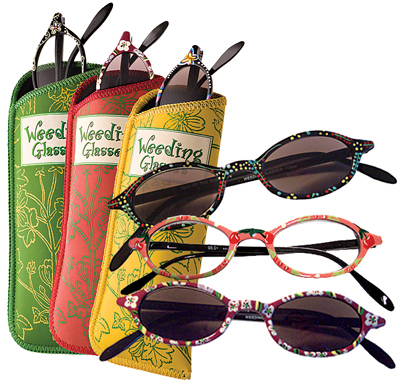 Weeding Glasses are available in Bifocal Sunglass, Full Sunglass Reader and Clear lenses. Choose your mix! 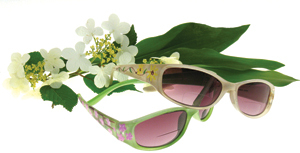 All Out of the Blue Sun Readers provide 100% UVA/B protection. A portion of all Weeding Glass sales are donated to the Sierra Club Foundation. Their work reflects the core values of people everywhere: That we all have a right to a safe and healthy environment, clear air, clean water, open space, wild lands and a healthy and diverse ecosystem.